I adore French Food. The cream, the butter, the cheese... it's very in-line with my view on whole foods eating and WAP (Weston A. Price) food choices. It's pretty easy. Eat real food. Plain and simple. Michael Pollan had a good way of putting it. If it comes from a plant, eat it. If it's made in a plant, don't eat it. With all the wonderful, seasonal foods available this time of year, you don't have to look far for some incredible fruit and veggies. We purchased a box of fresh blueberries recently and look at this decadent dessert. Julia Child... she wrote the book on French cooking... literally. Hee hee. She is a genius and this recipe is wonderful. 1. Put the milk, 1/3 cup sugar, eggs, vanilla, salt, and flour in a blender in the order in which they are listed. Blend at top speed for one minute. 2. Pour a 1/4 inch layer of the batter in a lightly buttered 7 or 8 cup fireproof baking dish, cast iron skillet or Pyrex pie plate about 1 1/2 inches deep. 3. Set over moderate stovetop heat for a minute or two until a film of batter has set in the bottom of the dish. Remove from heat. 4. 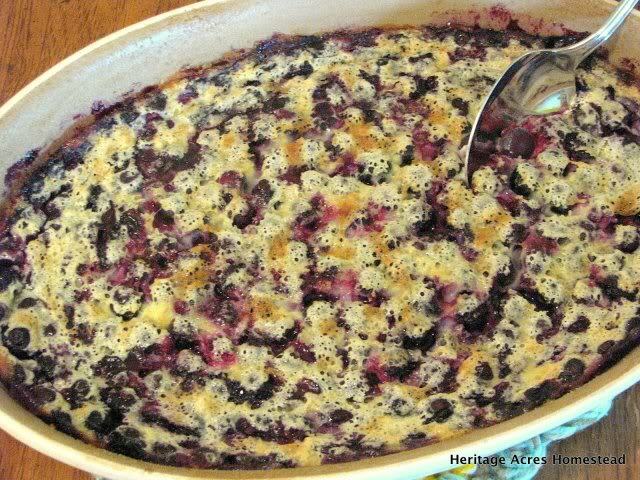 Toss the blueberries with lemon juice, and then spread them over the batter and sprinkle on 1/3 cup of sugar. Pour on the rest of the batter and smooth the surface with the back of a spoon. 5. Place in the middle position of a preheated 350-degree oven and bake for about an hour. The clafouti is done when puffed and brown and a knife plunged in the center comes out clean. 6. 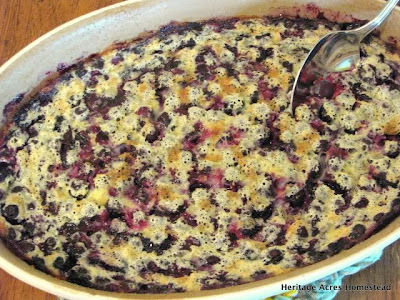 Sprinkle the top of the clafouti with powdered sugar just before bringing it to the table.